Celebrating 94 years of great brand heritage, timeless history and record-breaking milestones, we bring to MG India’s digital strategy full of experiences and storytelling. Translating great brand heritage, timeless history and record-breaking milestones, for an iconic car brand like MG would anyways have been a task, but for a brand that is 94 years young, and plans to expand its footprint in the highly competitive automotive industry in India, it’s even a bigger task at hand. The Indian automotivespace is highly competitive when it comes to spends on digital mediums and takes away annual budgets up to 20-25% for the marketing spends. 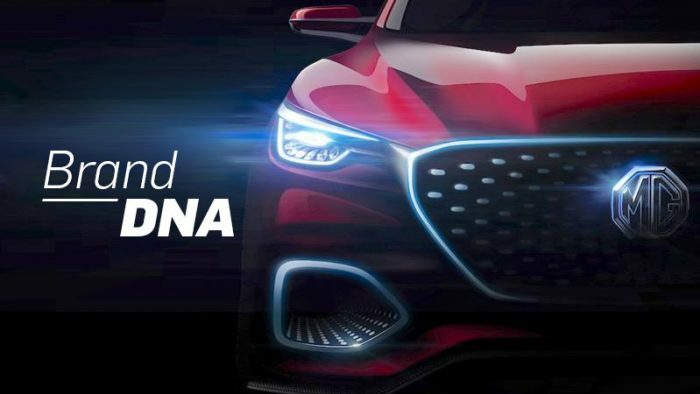 However, the key differentiator between current automakers and MG is – OEM products in-market v/s MG products that will launch in 2019. The task at hand: How do you imbibe the prosperous characteristics of an iconic brand, while communicating with the digital savvy demographic, who might or might not be aware of or recollect the grandeur a particular brand? While there might not be hard and fast answers to such queries, some brands personify themselves to ease. Enter – MG; you might remember them as Morris Garages – the vintage car brand makes its entry in India, while managing to route their offline grandeur into pristine online engagement. Before we tread through their social routes, a little about where it all started. Founded in 1924 in United Kingdom, MG finds a prominent place in motor sporting history since its early days. History will tell you that MG’s were loved instantly. The love for them was infectious and just a few years after the birth of the marque, it outgrew its Oxford home, and moved to a new factory in the nearby town of Abingdon on Thames – a place MG would call home for over 50 years. The origin of the brand’s name – Morris Garages – can be traced back to 1921 when motor manufacturer William Morris hired Cecil Kimber. The story of MG (Morris Garages) began in 1924 in the UK. One of the most sort after, MG Car Club too has its roots back in 1930s. It is till date an independently run car club, with over 70000+ MG enthusiast and owners from across the world. It is one of the few MSA (Motor Sports Association) approved car clubs in the world as well. MG and various MG’s built by the brand, went on the break many incredible records. They took a class win at the iconic MilleMigliain the 1933 race. In 1957 and 1959, MG would set a World Record, as MG EX 181 set speeds of 245.64mph and then 254.91mph on America’s Bonneville Salt Flats. Well, let’s just say the list is long. Talk about legacy! Since its birth, MG’s stunning sports cars and cabriolets were the ride of choice for many celebrities, including British Prime Ministers and several members of the British Royal Family. Now, how did MG translate such legacy and history into successful digital stories for engagement? Legacy brands more often than not find themselves against the tide in the social waters. 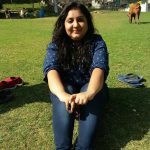 The key challenges being, attaining the same position of opulence in the online world, reaching out to newer audiences, and leveraging the existing loyalists as organic brand ambassadors – three fundamentals that are well placed in MG’s digital strategy. MG’s website is up and running and beautifully traces the history of the brand. You can read about most of the milestones till date in MG’s. A brick by brick, round-up of MG’s past, crisp enough to appeal to the digital dimension, and yet elaborate. We’re soon expecting an overhauled version of the website, as the brand moves closer to its product launch in 2019. MG’s Facebook page is focussing on two things that probably the marque’ best – People and Experiences. With aesthetic and magnificent creatives, MG manages to convey the brand tone and personality on Facebook. The posts are threaded into a content calendar basis a few major themes. Quality images of MG cars placed against pleasant present day backgrounds or vintage images conveying the brand’s history. Given the superior creatives and exceptional tone, MG has managed to garner quality organic engagement and conversations. 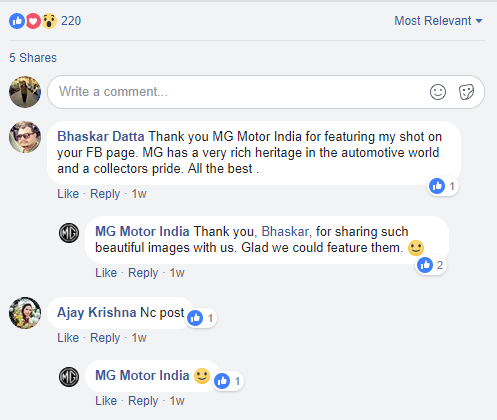 Further, MG leverages UGC to its optimum level, as loyalists share images of their MG cars on social media managing to creating quality conversations. Further, the brand is active in responding to every comment, bridging the brand-user gap through social media platforms. The brand has made a genuine effort to connect with its community of vintage and classic owners in India. A digital lead campaign, #StoriesOfMG, was run true to the Brit wit which now they are translating into a campaign focussed on stories of their true loyalists and we believe they might extend to it their future owners also. The campaign narrates enriching chronicles of MG cars belong to people around the globe, packaged to convey the story and personality of the brand to the new users they acquired online. Launching an India chapter of the prestigious Mg Car Club is definitely a no-brainer for a brand like MG. and that’s what they seem to be working towards already. Further, MGhas organised a greet and meet with MG Car Club General Manager Adam Sloman and their classic owners introducing the Car club in India. 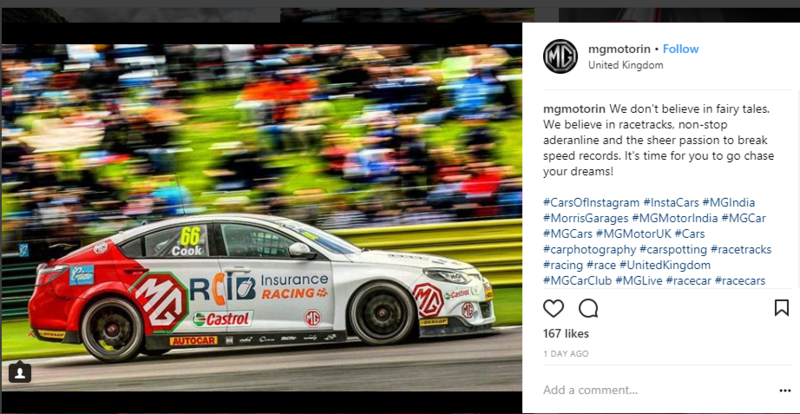 In an upcoming effort, MG is slated to launch, MGLive!, an Instagram campaign. The build-up is happening for MG Live! – its 68th edition which happens at Silverstone – the iconic Grand Prix circuit. The event is expected to witness over 3500+ MG cars and 10000+ attendees from al over the world. True to the platform’s nature, MG maintains a rich and aesthetic vibe on Instagram, leveraging quality images at their disposal. Instagram also plays a crucial role in marketing the brand’s upcoming campaign. MG seems to be trying to tread a different path, and it seems to be working well. The brand is staying true to its focus on people and communities by investing into experiences way ahead of their product launch next year.